Trampoline Size Guide 2019 | Finding the Right Trampoline for You! Trampolines come in a number of different sizes and shapes for multiple reasons. Mini exercise trampolines aren’t useful as a backdoor play trampoline for your kids, which is why it’s important to look different trampoline sizes and shapes to see which is best for you. Different sizes and shapes benefit certain requirements. For example, do you have any kids, how large is your backyard, etc. Finding the perfect middle ground, and the best-rated trampoline for your requirements is what we’ll help you to do. 1 Trampoline Shapes: What’s the difference? 5.1 How do you measure a trampoline? 5.2 Which is the best trampoline size? 5.3 Are there weight limits on large trampolines? 5.4 Which is the best trampoline size for a family? Trampoline Shapes: What’s the difference? Trampolines come in all different shapes and sizes! The most common types of trampolines you will find are circular and rectangular. You can also find oval and square models, but those are usually difficult to find. The most difficult shape to find are octagons, which are very few and far between. Your decision on the size and shape of trampoline will rest solely on a couple of factors that need to be considered first. Looking for trampolines bigger than 15 feet? Check out our guide to huge trampolines by clicking here! Even though the various sizes of trampolines can be rather overwhelming, we’ll guide you every step of the way! Below you’ll find the most common sizes of rectangular and circular trampoline sizes, how to choose one that will suit you best, what they’re good for, etc. 7×10 ft and 8 ft rectangular trampolines are portable, able to be placed in smaller areas of your backyard. This is typically the smallest size of rectangular trampoline you can get for an outdoor setting, perfect for those on a budget. If you’re looking for the best bounce possible, we recommend getting an 8×12 ft rectangular trampoline. They’re great for young gymnasts looking to work on their skills or get into the sport. Even a regular 12 ft rectangular trampoline has the right amount of bounce that kids will love. Both are the perfect size for up to 2 kids at a time. 9×14 ft rectangular trampolines are best suited for those who are serious, professional gymnasts and looking for extra room to bounce on. Like the previous sizes mentioned, they have a great amount of bounce but do not cause any serious wear on the springs over time. 10×17 ft are Olympic-size trampolines, perfect for multiple people, great amount of bounce, and are the largest size of rectangular trampoline you can get. 8 ft and 8×10 ft circular trampolines are generally only bought by those who want a low-cost, small trampoline. They are the best ones for anyone who doesn’t have a lot of backyard space or a high budget. These, however, are generally only safe for one child at a time. Otherwise, they can be dangerous. 12 ft circular trampolines are large enough for up to 2 people, especially kids, at a time. 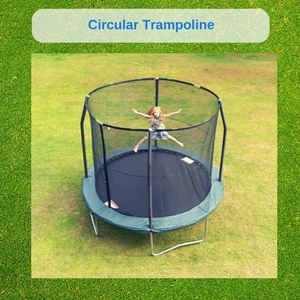 These are the most common medium sized trampoline types of circular trampolines seen in stores, backyards, etc. 14 ft and 15 ft circular trampolines are best for gymnasts, adults, and multiple kids at one time. They are the biggest circular trampolines you can find an are generally the safest because of the large amount of bounce space. Because trampolines come in multiple sizes and shapes, it’s important to know what they are, how much room you have in your backyard, who will be using it, etc. Selecting the right trampoline for you and your family, or just yourself, will ensure that everyone who uses it will be safe. Having a large enough backyard to accommodate a large trampoline isn’t always ideal, but it’s your best bet. The bigger the trampoline, the more fun you can have. Even if it’s a tight squeeze, we highly recommend getting a large one. If you don’t see your question, or an answer to it, listed below, please let us know and we’ll do our best to help you out! How do you measure a trampoline? 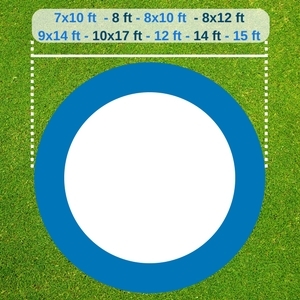 To measure a circular trampoline, all you have to do is measure one end of the frame to the other end of the frame. 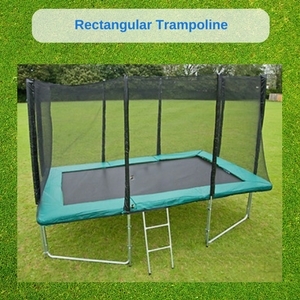 For a rectangular trampoline, however, it gets a bit difficult. You’ll need to measure the length from one frame to the next, and then measure the width from one frame to the next. Which is the best trampoline size? The best size of trampoline depends on the intended use, who it’s for, how many kids you have who will be jumping on it, etc. In short, it all depends on your personal circumstances. Are there weight limits on large trampolines? Absolutely. Before anyone steps foot on the trampoline, you must be sure of what the weight restrictions are. Even the largest trampolines have their weight limits. You can find the exact weight number from the manufacturer’s instructions, typically on the box or within the instruction booklet itself. Which is the best trampoline size for a family? A 10×17 rectangular trampoline, an Olympic size, is perfect for the whole family. It has enough space and bounce to ensure that nobody is going to be banging heads, as long as they are all jumping safely and not being careless. You should also consider one with enclosed netting, too.